The Quality was very very good and the money was worth it. Does the job as it should and does it nicely. Plug and play makes it easy to operate immediately and the downloadable guides/instructional videos answer any questions you have even if you're a beginner. The buttons have a nice quality touch to them and the lights are awesomely bright. All round very happy with my purchase. Great for use with Ableton Live! decent price too. Trusted and enjoyable product. Fair price for this product. Highly recommended seller. I’ve got 2 launch controls as well and experienced some midi conflicts initially. I contacted online help and they advised me to set the all the device id’s. That fixed my problems and my setup is solid now. Honestly better than the xbox i love the launchpad! Excelent product! For those persons who use Ableton, it's very useful, you can use it in different ways, and it's a new interactive way to make your music. If you use Ableton, you must to have a Launchpad. The product delivers on everything that it promises. The pads have a nice tactile bump that give it a nice feeling. Doesn't take up too much space. Came very nice. Although a reformed product, it seems to work perfectly. I love how it works. It is a really great production tool. Does what I expected...use with live lite 9. Very high build and materials quality. Enjoying it. Una excelente calidad de materiales, además llegó en perfecto estado. Grandes colores y gran uso a lado de ableton que viene integrado. It smells made in China but feels high Quality.No corners where Cut and for a great price I will say that this is really worth it! It's a great MIDI controller for beginners and Finger drummers alike. Great led lighting and pad quality. Love it. Great product, delivered timely, simple activation process. Happy customer! Great product, this was a product for my son, and he liked it a lot. I think its a good starter point to get yourself in the music world. Great product arrived in exceptionally short time. Had contact with cust.service regarding delivery, service was perfect as well. Can t wait to use my launchpad! For a beginner like me at first it's a bit tricky to get into using it the right way. But after a few sessions it's so much fun to use. The possibilities are endless. Launchpad Mk2 is very helpful when I am creating my own flow. I can let my idea flows in without worrying about controlling many kind of stuffs. This product offers a great way to control your DAW. Setup with Ableton was easy. It removes some boundaries for my creativity and offers me some new ways to make noise. Great product, lots to offer, and absolutely genius idea. It is durable, entertaining, somewhat addicting to mess around with, and sold for a pretty reasonable price. Awesome product, is more than I expected ! My son enjoyed a lot using this product. He already explored a lot of things and hoping to create his own style in near future. Thank you and I am willing to purchase all related products to complete the set. I've waiting 6 Years to acquire something like this. this is so good, i'm living the dream of making music. Great product: it works perfectly fine and it's really fun to play with! The launchpad is just magnificent. It's super easy to use, and easy to get started with. Its' definately a must purchase if you love to mix with music! It worked straight out the box. Easy to use with a very unfussy interface. Very intuitive and has made making my music easier and a more tactile experience. I would recommend the launchpad to any Ableton user. Its grate andò i never thought that it would ne so Hood andò sexure to buy. The price is great forma the quality. The Launchpad is heaps of fun! The whole family has enjoyed putting together beats through the IOS App which is intuitive & easy to use! Looking forward to extending the range in the future...Launchkey is next! I love the Launchpad!!! Very challenging and fun! Great product, easy to setup and use. Excellent product. The fastest shipping ever. Wonderful support. Works better than I expected for a refurbished model. Completely satisfied! Nice design, so ergonomic, very striking, light weight, funny, easy to handle, so modern music tool. Amazing colors. The package is impressive, the butons are gentle to fingers. So excited with this product. Amazing product works great and is a lot of fun to use. The launchpad is amazing. There's a lot of tutorial videos online. It is very intuitive and easy to use if you have a good grasp on music, electronics, software, and technology. Works better than expected ! I recommend this product to everyone that wants to try out launchpad ! Muy buen producto, mi hijo que tiene 12 años lo maneja y disfruta mucho. Sin duda lo recomiendo mucho. great device, wish it had pressure and velocity sensitive pads though. The Launchpad is great for triggering midi clips, and sequencing. I love the design of launchpad and it is easy to use. I bought it for the second time, however, the delivery is to slow that I need to wait for more than a week. This item is of hight quality and makes a lot of fun. Awesome product! Anyone who is wondering, import costs to BC, Canada was $41.53 Great addition to my studio. Très bon achat qui vaut son prix. Got so much fun beacause i play with friend now so we dui sone song and have so much fun !! I really enjoy playing around with this but the software that comes with it is quite limited and to purchase the upgrade costs more than the Launchpad itself. Essential product for any electronic music enthusiast! Better for me than the mini version, since I have big fingers. Arrived sooner than expected. Wonderful overall experience. Great instrument. Arrived quickly as promised. It is a pity it was expensive to release customs and delivery at customer's home. After all, "free shipping" was promised.. The LaunchPad MK2 is an amazing piece of music equipment; I would recommend it to anyone who wants to get into making music, remixes, drum beats and for playing other peoples' projects. The LaunchPad MK2 is very durable. The lights on the Launcpad MK2 are bright and colourful and the response of the lights are almost instant. The response of the touch to sound usually varies as your computer controls the sound output but on my computer the sound is projected instantly without no problems. Rien à dire c'est super ! vraiment satisfait ! Its fun to use but it's not actually that useful. AWESOME SERIOUSLY COOL LIGHTSHOWS WITH GREAT MUSIC!!! My launch pad is very cool but the tutorials aren't that helpful. My son loves it! He enjoys mixing music with it! He's never mixed music before this launchpad... now he's a pro! The Best!!!! Of All, incredible Iconic and very funny. I love it. I recentli bought. But it'has some limited funcions, so it seems. In general it's funny. the launchpad is built amazingly well and works seamlessly with Ableton live. it has improved my workflow 100% and has given me the confidence to make music like never before. its a really cool device that allows you to play anything you want. it will have its hiccups every now and then but about 95% of the time nothing happens. I really love this product, it works perfectly. The only thing that is dissapointing is that you only get Ableton lite, which doesn't come close to letting you do all the many thinks available with ableton suite or even standard. My son is loving this launchpad, just wish it could be used without a computer, and came with speakers. Super easy to order online with speedy delivery. Very impressed by this. High quality product which is simple to connect to play. Now all that is left to do is to jam on! This is the iconic Novation Launchpad: the favourite grid controller for Ableton Live performers, now with RGB LEDs. Mirror the Live Session View clips, arranged and colour matched across the 64 button grid. Integrates immediately and seamlessly with Ableton Live, without any setup whatsoever. Just plug in and start making music. All 64 RGB pads light up to match the colour of your clips in Live and you can see at a glance what's loaded, playing and recording. Bright, colourful pads make the unit stand out just from USB power; on stage or when creating exciting Launchpad lightshow videos that are all over YouTube. 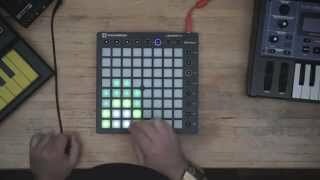 Max for Live lets you use your Launchpad however you like – turn it into a step sequencer, trigger videos from drum pads or use it to create just about anything you can imagine. Alternatively, engage with the whole community of Max for Live creators to find limitless inspiration and downloads. Sleek, tough and lightweight, Launchpad is fully USB bus powered so you'll never need to carry a power supply.